At YES, Table Captains are the people, the stories and the hearts behind our organization, stepping up on behalf of struggling children, youth and families on the Eastside, and inspiring others to do the same. 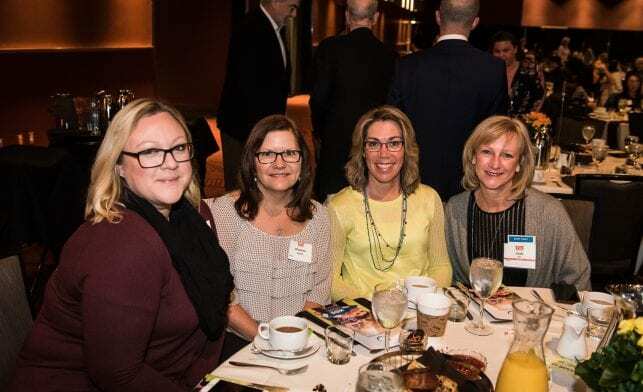 Each year, at the breakfast Table Captains help bring together over 1,000+ community friends, civic and business leaders with a passion for helping young people in crisis. The support of these Table Captains helps bring awareness to mental health and substance use issues in our community, and raise funds to help YES continue to provide services for nearly 7,000 children, teens and family members dealing with: depression, grief, trauma, substance use, anxiety, ADHD, autism, sexual abuse, eating disorders, low self-esteem, cultural and gender-identity issues, and much more. What does a Table Captain do? Invites: Table Captains invite friends, family members, co-workers, business partners, vendors, neighbors, fellow parents, anyone with a passion and interest in helping young people thrive. A Table Captain typically commits to filling a table of 10, but some choose to do a half table or even two or three tables! To register as a table captain, click here. Communicates: YES will send reminders about the event and direct Table Captains and their guests to our website and social media channels for event resources. We will also send a reminder to all guests before the event. YES will provide Table Captains with all the materials and support to make inviting guests easy and fun. Hosts: During the program you will be instructed to distribute the pledge cards to your guests at your table. Guests are encouraged to give a minimum suggested donation of $200. Thanks: After the event, thank your guests! A quick phone call, email or thank-you note will be greatly appreciated after the event. We hope you will join us as a Table Captain for our 2019 Invest in Youth Breakfast. Register to be Table Captain today! For questions or more information, contact Angela Chapman at AngelaC@youtheastsideservices.org or 425-586-2326.